Have you noticed pigeons in your attic or on your roof lately? Are you sick of doves leaving droppings all over? If you are dealing with a pigeon problem, then you should seriously consider seeking professional assistance. Pigeons are known for causing damage to buildings, vehicles, and machinery with their droppings. Not only do the droppings smell bad, but they can also be destructive to the overall look of a building and increase the rate of its destruction over time. A pigeon problem is no light matter. If you fail to deal with the problem quickly, the damage caused by pigeons can become significant over time. You will also want to clean up and repair any damage on a regular basis in order to maintain a safe environment for your office and a safe, clean environment for your family at home. At Critter Control, we can offer you services dealing with pigeon droppings, feather cleanup, pigeon trapping, pigeon removal, and pigeon control services. Just call our offices to learn more today. 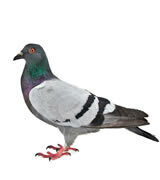 We offer methods of pigeon removal and control that greatly help with prevention. The best way to prevent damage in the future is to implement a bird management program now. This solution will have multiple controlled strategies that will help with getting rid of the birds and cleaning up droppings.